Testfire Labs, developer of artificial intelligence (AI) enterprise productivity tools, announced today the commercial availability of its award-winning flagship product, Hendrix.ai. More than 100 organizations have already tested the beta version of Hendrix, a natural-language AI assistant that attends business meetings, transcribes meeting summaries and action items, and archives those summaries in a simple dashboard alongside insights about users’ meeting history. With Hendrix, users can simply search keywords, dates, or names within the dashboard, to quickly and easily find and recall key meeting details. Enhanced reliability – New testing and monitoring protocols ensure that the commercial version of Hendrix is more reliable than ever. Fast delivery of meeting summaries – Hendrix delivers summaries to user email inboxes and the dashboard archive in 24 hours or less. Dashboard control – Hendrix now comes with “his” very own dashboard, complete with a searchable meeting history, relevant meeting statistics, and the ability to manage phone numbers and account preferences. Editable transcripts – Hendrix now provides users full editing control over the meeting summaries he creates, so users can add more content, adjust text, or flag additional action items, if they choose. Hendrix.ai was recently named to the Constellation ShortList™ for Augmented Meeting Services in Q3 2018, was the recipient of the 2018 Startup Canada Prairies Region Innovation Award, and named as a finalist in the Best Intelligent Assistant category for the 2018 AIconics Awards. Damer founded Testfire Labs, his fifth startup, to create ways for companies to leverage technology tools that help their employees be more productive and fulfilled in their work. 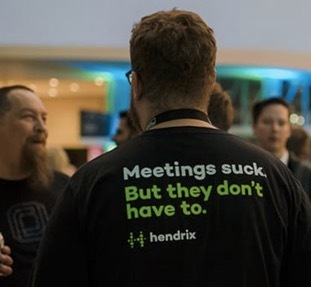 The first commercial version of Hendrix focuses on data capture for business meetings, which have been found to waste, collectively, almost $40 billion per year, according to data collected by software company Atlassian. The commercial version of Hendrix.ai is available now to North American organizations at the enrollment website: http://bit.ly/2xgrQyy. Subscriptions, which include a free, fourteen-day trial, start at just $39 per month. Testfire Labs develops enterprise productivity tools that modernize the way people work, so they can achieve more, faster. Founded in 2017 and headquartered in Edmonton, AB, Testfire Labs has received seed funding from the National Research Council of Canada Innovation Research Assistance Program, Iris Technologies Inc., Alberta Innovates, and various private investors. The company recently was selected as a Top Startup to Watch by Startup Edmonton, named the 2018 Prairies Region Innovation Award recipient for Hendrix.ai by Startup Canada. Additionally, the Information Technology Association of Canada (ITAC) has named Testfire Labs as a finalist for its 2018 Ingenious Spark Award, and Testfire has also been nominated for Startup of the Year through the National Angel Capital Organization (NACO). Information is available at https://www.testfirelabs.com/.